in that village made a plan to use sundaram's brilliancy for his selfishness. He promised him that he will bare all the money to send him to US. The villan kidnaps sundaram in middle of the journey and used him to create anti social elements. NTR is a police officer who appointed to solve this case. 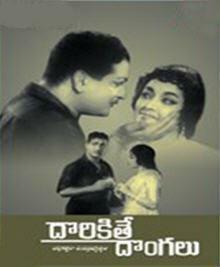 Then story runs in a thrilling manner and finally NTR chases the case. Dorikithe Dongalu Sundaram(Kantharao) is a brilliant scientist intends to service society with his brilliance. he is a son of police commissioner and he gotta go to US to implement his ideas in a manner to create wonders. But he doesn't have such a huge money to fullfill his desire. A rich personin that village made a plan to use sundaram's brilliancy for his selfishness. He promised him that he will bare all the money to send him to US. The villan kidnaps sundaram in middle of the journey and used him to create anti social elements. NTR is a police officer who appointed to solve this case. Then story runs in a thrilling manner and finally NTR chases the case..